New state funding reports indicate that ECOT had nearly 8,000 fake students in its last full year of operation. According to the Ohio Department of Education, its last year of operation, ECOT couldn't account for about 20 percent of its students. However, the monthly finance reports ODE puts out suggests the number may have been closer to 55 percent. First of all, the last year ECOT was fully operational was in the 2016-2017 school year. So I'm using that as a baseline for comparison. In the 16-17 school year, ECOT received $103.6 million for 14,208 students. This year, it's zero dollars. A lot of news stories have tried to figure out what happened to all those students. One of the challenges appears to be that they may not have actually had all those students. 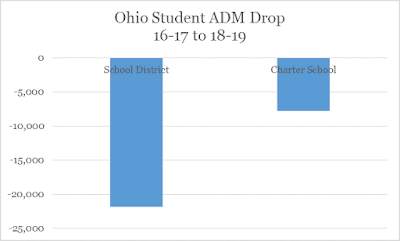 Looking at the changes in charter school funding and enrollment between the 16-17 year and the most recent funding report available from the Ohio Department of Education from this month shows that Ohio e-school enrollment is down 9,851 students. However, enrollment in Ohio's brick and mortar charter schools is up 2,060 students. So overall enrollment in Ohio's charter sector is down 7,791 students. Assuming the vast majority of those students came from ECOT, perhaps those 7,791 students may not have actually ever been there. Because school district enrollment is down 21,860 students from 2016-2017. If those 7,791 students returned to school districts -- the most likely landing spot -- one would expect school district enrollment to have showed an increase. But it's dropped a good deal. To be fair, without seeing actual head counts, it's tough to explain why. Was there a big graduating class in Ohio school districts in 2016-2017 that would help explain this? ECOT graduated about 2,000 students in 2017, but even subtracting out those students from the 7,791 "missing" students means 40 percent of the ECOT total is unaccounted for -- about double the rate that was found by ODE. So there seems to be something going on here. I would sure like to know how many, if any of the 7,791 students ECOT claimed it had in 2016-2017 that aren't in charter schools anymore were actually ever there to begin with. Because it looks like the state's 20 percent assessment may be significantly lower than first thought.